From the well-known likes of Boston Dynamics’ dog-inspired robots to more obscure robo-creations modeled on bats, manta rays, and snakes, there is no shortage of robots which borrow designs from the natural world as a way to solve problems. 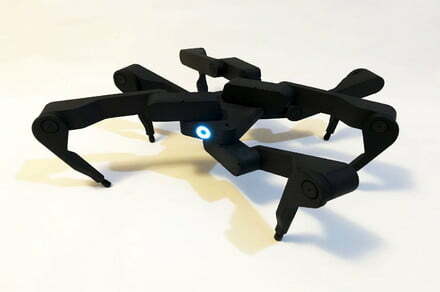 The latest machine to join this biomimetic motley crew is Z6, a portable and foldable spider robot designed by the Hong Kong-based company Robugtix. Boasting a compact form and foldable design, the robot is designed to potentially be used in applications ranging from search and rescue missions to exploration on the surface of other planets. For now, though, you’ll have to settle for watching the above 1980s-style “aerobics” music video, showing off Z6’s impressive levels of flexibility and coordination. In compact mode, the Z6 robot can tuck down into a neat 20 cm wide by 23 cm length by 13.7 cm height bundle. When it fully unfurls, it stands 17cm tall, with a width of 52cm and a length of 49cm. It can scuttle at a speed of around 30 cm per second, controlled remotely using a joystick. Oh yes, and like modern drones, there’s a built-in camera so you can follow its path courtesy of high-quality video streaming. As noted, Robugtix isn’t the only company to be making cool animal-inspired robots. However, unlike some which create these either exclusively as “calling card” demos or university research projects, Robugtix’s representative said that the company is considering selling Z6. NextElon Musk Unveils High Speed, Tesla-Launching Tunnel Under L.A.